Research before you buy! 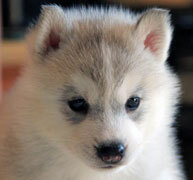 Is a Siberian in your future? Siberians are not trustworthy off lead. Siberians shed profusely twice a year. Siberians have a high prey drive. Siberians require consistent training and attention. 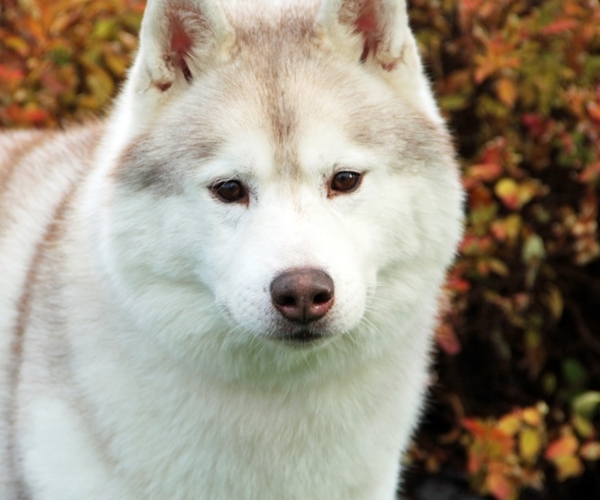 Siberians can have a number of health problems including epilepsy, zinc deficiency, hypo-thyroidism, hip displasia, eye defects, and ectopic ureter. It is important that you purchase a Siberian from a reputable breeder. Siberian Huskies can make wonderful companions for people who are aware of what to expect from these beautiful and intelligent animals. Although there are ‘exceptions to every rule’, there are a number of breed characteristics that are generally present among members of this arctic breed. This is not meant to be a comprehensive list, as even the top breeders in the country will tell you that they learn something new about their dogs every day! Wandering Star – This breed should never be trusted off-lead. They will run and they won’t come back when you call them. Don’t be fooled into thinking that you can train them to stay in your yard. The many people who have tried and no longer have their dogs can attest to the risk associated with this impossible task. I can’t take my Siberian for walks, so how can I ensure he/she gets exercise? Houdini Lives – Siberians are escape artists. 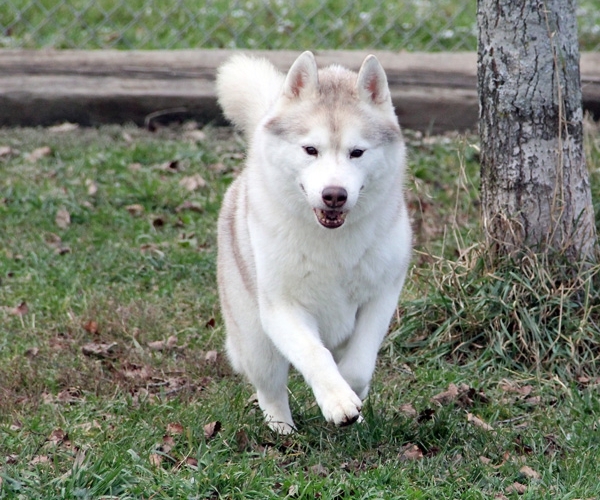 Siberians need a SECURELY fenced in yard if you want to let them off a leash. Over – They can jump or climb most fenced-in areas. Six feet is the recommended height. If your dog is a climber, you may need a roof for your ‘kennel’.Under – They will also very easily dig out underneath the fence, so it is recommended that if the fence is not placed upon concrete then something should be buried along the perimeter of the fence in order to properly contain them. Through – Leaving them in a yard or kennel unattended for great lengths is not appropriate for this breed as they are highly intelligent and they WILL find a way out. If the fence is made of a weak gauge of chain link that isn’t securely attached, they can push the fence up or chew through it. This can also occur with wood. No other alternatives – Because they are sled pullers, tying your Siberian out is not appropriate as not only will they escape, other neighborhood dogs then have open access to him/her. They are social animals and will want to be with you. Underground or ‘invisible’ fences are also not effective for this breed. They learn very quickly that with a good running start, they can get past the range of the fence. Additionally, their thick fur interferes with the effectiveness of the collar. Because they are highly predatory, their prey-drive may override any amount of training or shock received. Green Thumb – They instinctively dig and will leave large holes, even trenches, throughout your yard. Kirby vs. Hoover – Do you own a good vacuum? Twice a year, Siberians do what is referred to as “blowing coat” where they lose their bottom layer of fur, or undercoat. It is a mess! It generally takes at least a week, sometimes more, for all of the fur to leave the coat. You could brush the dog from sun-up until sun-down and the fur would still be coming out. This is not an exaggeration. 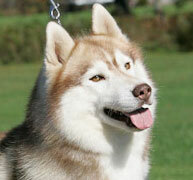 When a Siberian is not ‘blowing coat’, the amount of shedding is minimal to moderate, depending on the climate. Each dog is an individual, but as a general rule, they do have lots of energy, especially for the first two years. High Voltage – This is a high energy breed, especially for the first two years of life. They are not usually suited for people who won’t provide any exercise opportunities for the dog or leave them in a crate for long periods of time. Crate training is recommended both for the safety of your home, but also for the safety of the puppy; however, if your work schedule has you away from the house for much more than 8 hours a day, you will come home to a very anxious puppy! Yes, but it is usually on their terms! Snack Time – This breed has a high level predatory instinct and they will hunt cats, birds, and other smaller animals. Sometimes, when a Siberian is raised with a cat, owners have had success with this integration; however, in most cases when an older Siberian is introduced to a home with a cat, the Siberian cannot be trusted. Every dog is different, so it is difficult to generalize concerning their adaptability with other dogs. Their ability to get along with other dogs, as with any breed of dog, also stems back to their level of dominance and ‘status’ within the hierarchy. Where can I find other information on Siberians? 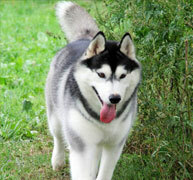 There are many informative web pages that you can visit to find out more information on the Siberian husky. 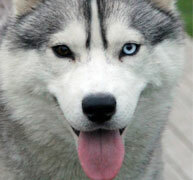 www.huskycolors.com, The Canadian Kennel Club, The American Kennel Club, and the OFA website. At the OFA site you can check and see if a kennel is doing OFA health checks on their dogs. See also our “links” page. The most common requests for information that we get from people who have recently purchased puppies are those concerning housebreaking. Originally, we were going to include a list of related links; however, upon further scrutiny, we decided that it might be best to simply include the techniques or recommendations that have worked best for us. Supplies: Obtain the proper equipment: crate, collar and leash, and deodorizers. Breeder: Obtain a puppy from a reputable breeder in an effort to ensure that you are purchasing a healthy puppy from someone who is in a position to provide background information on the puppy’s parents, grandparents, etc. Or if you get a puppy from rescue, try to learn as much information as you can about his upbringing and background. Diet: Provide a proper diet using a high quality food and avoid sudden changes in diet. Large amounts of ‘treats’ can be considered a sudden change in diet, as well. Vet: Ensure adequate veterinary care for your puppy. Sometimes, difficulty in house training can be as a result of an underlying condition such as kidney problems, blood sugar, urinary tract infection, cystitis, parasites, etc. Control: Keep your puppy within reach. You should keep the puppy in your sight at all times. The bottom line is that there is no such thing as your puppy having an ‘accident.’ If you aren’t watching your puppy – it is your fault. Whenever possible, have the leash and collar on your puppy, even in the house, and keep him with you. If he starts to ‘go’ in the house, apply a correction to the leash and tell him ‘STOP!’ Take him outside right away – even if he finishes in the house. By keeping him within your reach on a leash, you can apply the correction instantly. You won’t need to chase him around the house! Use the crate: If you can’t have the puppy right under your feet, then he should be in his crate. Make sure that he isn’t hungry, thirsty, or in need of a restroom break before putting him in. The crate is not a punishment. Take the collars and leashes off while he is inside the crate. If he relieves himself inside of the crate, use the odor neutralizers and clean him up, but don’t punish him. They will learn to look at the crate like a den if properly trained. See the crate training link above. Consistency is the key. When you take him outside, always use the same door. Try to use the same procedures for getting his leash and collar, etc. Be prepared to stay outside, even if the weather is inclement. Select a specific area to be used for that purpose and stand in one place. Your puppy will be distracted by moving around to different places and may forget why he is outside. Wait until he is completely done relieving himself (wait a few minutes afterwards to be sure) and praise him! Allow 10 -15 minutes for him to go. If he doesn’t, then go back inside and closely watch for signs that he may need to go outside again (after eating, napping, before exercise time). Set a kitchen timer or alarm clock to remind yourself to take him outside on a regular schedule – and no more than three hours from his last time out. After he has gone, allow him to play and exercise. Only after he has gone at least 3-4 months without any messes will he be trained.